Thermal imaging IP camera. VGA. 9 fps. 65 mm lens. This thermal IP camera provides high-sensitivity thermal images using an un-cooled vanadium oxide microbolometer that delivers outstanding image quality. 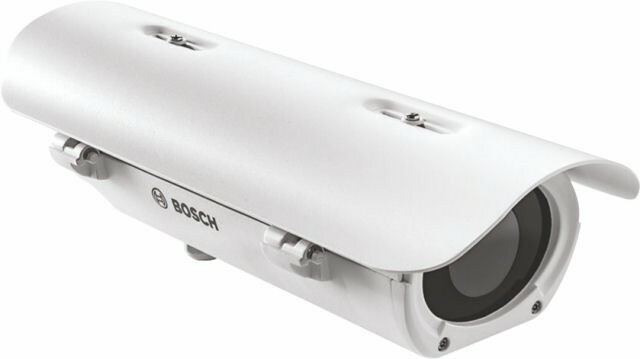 The camera is designed to combine the benefits of thermal imaging with the market leading Intelligent Video Analytics from Bosch. There is no need for natural or artificial lighting of the area of interest. The camera produces crisp and clear images day and night, even in challenging environments with smoke, dust, haze or fog. The camera comes with a choice of narrow field-ofview (NFOV) or wide field-of-view (WFOV) lenses. The QVGA resolution variant is available with a frame rate of 9 or 60 fps; the VGA resolution variant is available with a frame rate of 9 or 30 fps. The camera is enclosed in a robust outdoor housing making it ideal for a wide range of applications in demanding environments. The mission critical video analytics reliably detects, tracks, and analyzes objects, and alerts you when predefined alarms are triggered. A smart set of alarm rules, together with object filters and tracking modes, makes complex tasks easy. The system is also extremely robust and is able to reduce false alarms, for example from foliage or shaking objects, even in harsh weather conditions. Metadata is attached to your video to add sense and structure. This enables you to quickly retrieve the relevant images from hours of stored video. Metadata can also be used to deliver irrefutable forensic evidence or to optimize business processes based on people counting or crowd density information. Calibration is quick and easy – just enter the height of the camera. The internal gyro/accelerometer sensor provides the rest of the information to precisely calibrate the video analytics. The innovative multi-streaming feature delivers various H.264 streams together with an M‑JPEG stream. These streams facilitate bandwidth-efficient viewing and recording as well as integration with third-party video management systems. Depending on the resolution and frame rate selected for the first stream, the second stream provides a copy of the first stream or a lower resolution stream. The third stream uses the I-frames of the first stream for recording; the fourth stream shows a JPEG image at a maximum of 10 Mbit/s. Recording management can be controlled by the Bosch Video Recording Manager (VRM) or the camera can use iSCSI targets directly without any recording software. Insert a memory card into the card slot to store up to 2 TB of local alarm recording. Pre-alarm recording in RAM reduces recording bandwidth on the network, and extends the effective life of the memory card. A surge-protected analog video output allows full hybrid operation. This means that high resolution IP video streaming and an analog video output are available simultaneously. The hybrid functionality offers an easy migration path from legacy CCTV to a modern IP-based system. Special measures have been put in place to ensure the highest level of security for device access and data transport. The three-level password protection with security recommendations allows users to customize device access. Web browser access can be protected using HTTPS and firmware updates can also be protected with authenticated secure uploads. The on-board Trusted Platform Module (TPM) and Public Key Infrastructure (PKI) support, guarantee superior protection from malicious attacks. The 802.1x network authentication with EAP/TLS, supports TLS 1.2 with updated cipher suites including AES 256 encryption. There are many ways to access the camera’s features: using a web browser, with the Bosch Video Management System, with the free-of-charge Bosch Video Client or Video Security Client, with the video security mobile app, or via third-party software. The camera conforms to the ONVIF Profile S specifications. Compliance with these standards guarantees interoperability between network video products regardless of manufacturer. Third-party integrators can easily access the internal feature set of the camera for integration into large projects. NHT-8000-F07QS Thermal imaging IP camera. QVGA. 9 fps. 7.5 mm lens. NHT-8000-F07QF Thermal imaging IP camera. QVGA. 60 fps. 7.5 mm lens. NHT-8000-F19QS Thermal imaging IP camera. QVGA. 9 fps. 19 mm lens. NHT-8000-F19QF Thermal imaging IP camera. QVGA. 60 fps. 19 mm lens. NHT-8001-F09VS Thermal imaging IP camera. VGA. 9 fps. 9 mm lens. NHT-8001-F09VF Thermal imaging IP camera. VGA. 30 fps. 9 mm lens. NHT-8001-F17VS Thermal imaging IP camera. VGA. 9 fps. 16.7 mm lens. NHT-8001-F17VF Thermal imaging IP camera. VGA. 30 fps. 16.7 mm lens. NHT-8001-F35VS Thermal imaging IP camera. VGA. 9 fps. 35 mm lens. NHT-8001-F35VF Thermal imaging IP camera. VGA. 30 fps. 35 mm lens. NHT-8001-F65VS Thermal imaging IP camera. VGA. 9 fps. 65 mm lens. NHT-8001-F65VF Thermal imaging IP camera. VGA. 30 fps. 65 mm lens.